Last week was ‘purge’ week. That nadir of the year when you collect all of the old paper you’ve accumulated – bills, adverts, statements, letters – and burn the outdated rubbish in a steel bin. As I watched the sparks and embers curl up into the night sky, I came upon something that could not be so easily let go: a copy of the 75-page report on the Wallabies I had written for Graham Henry in preparation for the 2001 British and Irish Lions tour. As the flames licked up towards the heavy booklet, I weighed it in my hand, then put it aside. It was not time to burn the associations with that momentous tour. 2001 will live in the remembrance of all those who saw it, and lived through it, as one of the greatest Test series of all. Those seven weeks I spent travelling across the length and breadth of Australia are an underground reservoir of memories, intense and bittersweet, and from all points of the compass – Townsville in the north to Perth and Fremantle in the west, Brisbane and Sydney on the East Coast and Melbourne in the south – they are still with me today. It is still and will always be, Wallabies versus the British and Irish Lions, 2001 – the one that got away. 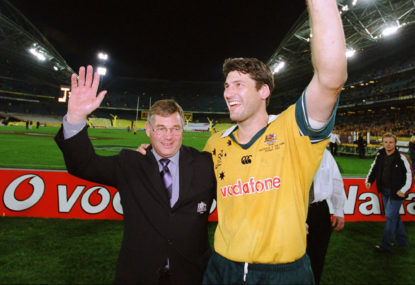 Under the auspices of Rod Macqueen, the Wallabies were the reigning World and Tri-Nations champions. Even on the rare occasions they were beaten, such as the incredible 35-39 Bledisloe Cup loss to New Zealand in 2000, Australian rugby remained a winner. However, I am convinced that this was one of the finest of all Lions touring teams. It contained a host of unique talents who ascended to the highest firmament in any UK hall of fame – Keith Wood, Martin Johnson, Scott Quinnell, Lawrence Dallaglio and Richard Hill up front; Rob Howley, Jonny Wilkinson, Brian O’Driscoll and Jason Robinson behind. At the same time, 2001 was the first properly professional Lions tour, and that team was emerging from a chaos of new demands. Most of the home nations were still very much in the process of adjustment to the new set of standards required. England were far more advanced in that respect than any of the Celtic countries. “When I saw some of the food that was on offer, I knew we would lose the Test series. There was some stuff on the menu that I knew the England players would never consider eating”. Where Wales analyst Alun Carter still used VHS video for his analysis, with the greater financial resources available to them the England players had already moved on to personal laptops and DVDs. The sophisticated structures introduced by England defence coach Phil Larder, who doubled up in that role for the 2001 Lions, were simply unknown to most of the Celtic players at that time. It made the tour as a whole, and Graham Henry’s life as head coach in particular, very difficult. The wider experience of Australia and the support of the Lions fans was, on the other hand, magnificent. Graham and I were walking down the street, looking for a quiet coffee bar to do a little last-minute plotting before the first Test in Brisbane, when a shout went up. We backed off and turned tail. What seemed like hundreds of Lions fans in red spilled out of that bar and ran after us down the middle of the street, cheering good-naturedly. We ended up trying to whisper ideas in a public park in the pitch black, our small reading light a tiny speck in the darkness. Somehow it was typical of the tour. That irresistible tide of Lions red flooded the Gabba the next day. It shocked the Australian players, who said after the match that it felt like they were playing away from home. It was then that the resilience of the Australian sporting mentality kicked in. 11-6 down at the half in the second match at Melbourne (it could have been more) and looking over the edge of the cliff at series defeat, the Wallabies turned the momentum around with an outstanding performance in the second period, running out winners by 35 points to 14. In a very tight final Test in Sydney one week later, they pipped us 29-23. There are lessons for Michael Cheika’s present-day Wallabies from the Rod Macqueen era, valuable learnings about what the ‘Australian way’ means in terms of attacking structure. In the research for my report, I had understood that Australia played most of their rugby between the two 15-metre lines. They very seldom strayed into the wider channels unless there was a clear and obvious breaking or scoring opportunity. They looked for size and physicality both in their centres – in 2001, Nathan Grey and Dan Herbert – and in their back three players (like Chris Latham and Joe Roff), and invented new ways to work through the middle of the field. They did not need twin playmakers at 10 and 12, or 10 and 15. It is essentially the same try in different clothes. The Wallabies’ 9 and 10 both tend to run away flat after receiving the ball. George Gregan pulls the defence away from the ruck before dishing the reverse pass to Toutai Kefu at 8:43 in the first example, and Owen Finegan at 1:45 in the second. 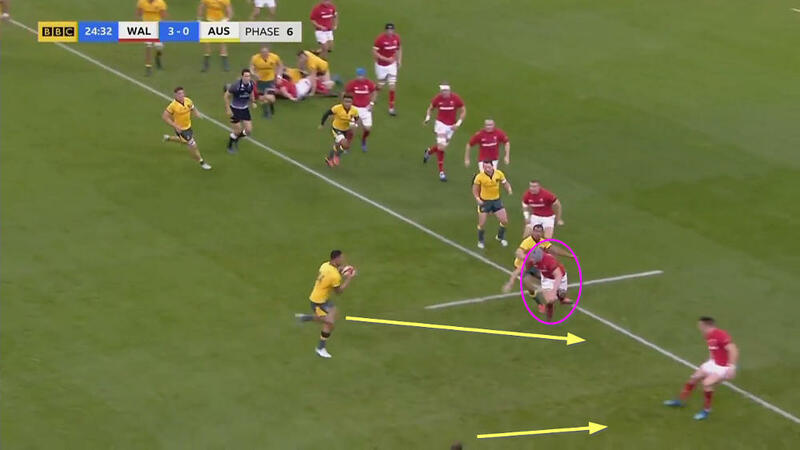 The outside-half (Stephen Larkham in Melbourne, Elton Flatley in the yellow cap in Sydney) takes the same line, either flat or on an outside arc – looking to offer the wrap- around to the ball-carrier, or circle around him for next phase. Runners come onto the ball die-straight, and if the play isn’t straight enough, an inside pass or a short phase back the other way straightens it further. Riskier gambits like the offload, or use of the wide zone beyond the 15m line, only come into the reckoning when a definite scoring opportunity presents itself. The defence is firmly fixed in place before those risks are ever embraced. The Australian comeback, after spotting New Zealand a 24-point lead, occurred at 3:05 on the above reel. At 3:08, Stephen Larkham offered the patented switch to Dan Herbert before arcing through the outside gap himself and creating a try for Stirling Mortlock. The theme of straightening the attack via switches or inside and reverse passes was key for the second try at 3:38 (Gregan to Jim Williams) and 4:08 (Gregan to Mark Connors). The attitude of the first receiver is the same as in the Lions clips, with Larkham constantly offering the ball to his centres on the cutback and then circling around them. Big back-three players like Roff and Latham went looking for the ball close to the ruck, and passes were only spun wide when the odds were stacked heavily in Australia’s favour. What we see in Michael Cheika’s current Wallaby attack (conceived by Stephen Larkham) is a very different interpretation of the ‘Australian way’. One excellent example of the changed priorities occurred in the Wales Spring international, in which the Wallabies failed to register a try. At a scrum on the Welsh 22m line, Australia advanced ten metres in 16 phases and just under two minutes of play. Even allowing for changes in the game over the last 17 years, the differences are eye-opening. This first phase features scrumhalf Will Genia engaging the defence – ironically the only time during the entire sequence when he was required to do so. Where George Gregan constantly tested and tortured the ruck-side defenders back in 2000-2001, Genia is asked to do little more than ship the ball on to the man outside him for the next 15 phases. 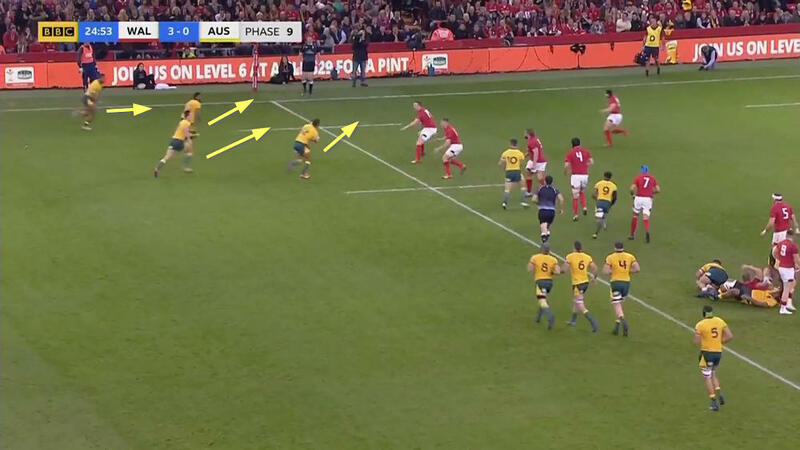 Ironically in the Cheika attack, more of the creative burden to change angles and find a deft pass falls on the two pods of tight forwards in midfield, as I highlighted in this article from the Rugby Championship match in Salta. What is the ‘Australian way’ in attack? You would get a very different answer from Rod Macqueen circa 2001 compared to Michael Cheika in 2018. Times may have changed, but the fact remains the only sustained period of effective offence Australia mounted in 2018 came in the second half of the final game of the Rugby Championship game, and it centred around the ball-playing ability of the Wallaby bench front row and some beautiful hard angles cut by their back-line diamond, Israel Folau. For the most part, the sample from the Wales Test was more typical, with forwards trucking the ball straight up in midfield and backs running wide for the corner-flag thereafter. Those 2001 Wallabies had more clarity about what they wanted to do and showed more finesse in the way they went about their business. George Gregan was a constant thorn in the side close of the defence to the ruck, while reverse and switch passes, and changes of direction in between phases maintained upfield momentum. Every time a Stephen Larkham ran wide, someone cut underneath him to force the defence to stop and think. Play only went wide when there was a definite opportunity to break or score. But my admiration for such a great Australian side won’t ever temper the restlessness and agitation provoked by that tour; the rueful knowledge that, for that outstanding group of British and Irish Lions players and coaches, the 2001 Test series was an opportunity within reach, but never grasped – the one that got away. One day, it may finally be time to burn the book. But not yet.